Not surprising, given the sweet, juicy taste and creamy texture of papaya. Due to a high concentration of the digestive enzymes papain and chymopapain, which are unique to the fruit, papaya offers valuable support for calming an upset stomach and speeding digestion – especially the digestion of protein. Green, or unripe papaya, contains the highest levels of these enzymes. Papaya also contains significant amounts of vitamin C, E and beta-carotene which can help reduce inflammation and support healing from minor burns. Ripe papaya juice has been seen to ease constipation due to it’s high water and fiber content. Papaya can be helpful in preventing morning sickness and motion sickness. Papaya seeds are sometimes recommended for expelling intestinal parasites like worms. This can be especially valuable in a tropical climate. I enjoy using ripe papaya in my smoothies. Another way I love to eat papaya is simply blended up with a tablespoon of coconut oil and a drop of lemon essential oil. That one, I serve over ice. 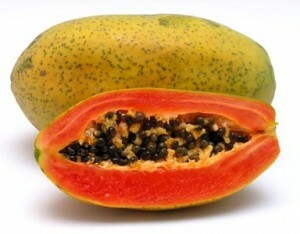 By the way, if you can’t easily get papaya, you may look into using papaya enzyme capsules. They are available at most health food stores and do a lot to support good digestion.